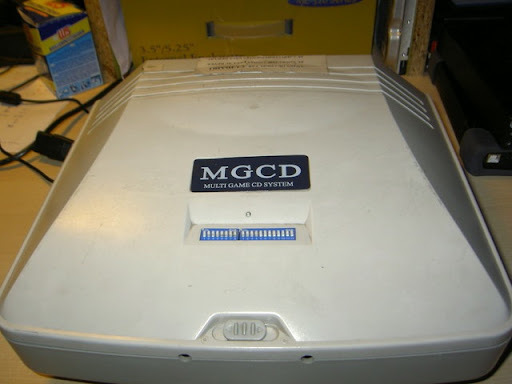 Where did you get the MGCD?...Can you set this up to play for credits ( Like the Arcade PCB ) or is it only timer.. Thanks. I bought mine a long time ago from cosmicco or excellencom (forget which), but they don't sell them anymore. They do pop up occasionally on neo-geo forum and ebay. To answer your second question, yes the MGCD can be setup to play for credits, although you have to look at the Manual I linked in the article which lists all the games its compatible with for credits. Otherwise credits for time is universal to any game. Hi! i have 2 MGCD interfaces exclusively made for Dreamcast in a Capcom VS SNK box, just like yours. Now, i know that changing dipswitches can get other games to work ... but what do i need to make PlayStation2 console to work with my MGCD interface? Where lies the diference between Dreamcast version and Playstation2 version? Just thinking if i would be able to change the joystick plugs? Hi Jorge! From a hardware standpoint, the two MGCDs are identical. Obviously the connectors are wired differently for the controllers and AV. Unfortunately the two chips with labels on them are also different. It says PS2 on both the chips for the Playstation2 MGCD. It makes sense as this is what would need to decode the joystick protocol for PS2 versus Dreamcast. These chips look like custom programmed ICs, not EPROMs so you will not be able to burn your own set. But there may still be a solution! If you set the dip switches to 256 minutes play per coin, and use a Dreamcast to PS2 controller adapter, this could work with a PS2. You'll have to hack an RGB scart cable to the AV connector similar to how I did it my blog entry. You just need to figure out which is R/G/B/Gnd/Sync. I can't express how gratefull I am after read all your posts about hacking/modding and improving Video consoles into arcade interfaces! About the solutions you suggested me: I realise the chip diferences on both boards. and really stop wanting to make it work with ps2 for two reasons: First: I really want ps2 games to work with coins/credits, (exclusive fighting games) not time. Hi Jorge, ebay has Dreamcast RGB and SCART cables which will have all the connections you need for the MGCD. Unfortunately I could not find a Dreamcast to PS2/PSX controller converter. Seems there are plenty of converters which work the opposite way, from PS2 to Dreamcast, this is not what you want. Have to keep checking ebay for this. Hi all im from australia and am trying to set up mgcd with my original xbox to use with an old scud race driving cabinet so i have rewired everything in jamma and have plugged the board in i however am trying not to use the on board video rather just pluging the svideo and audio from the xbox directly to my lcd screen. Hi Pat, first I assume you are using the XBOX version of the MGCD. Second, you are correct in that the MGCD will not work unless video is hooked up to the board...specifically the video sync. This is why I had to hack my Dreamcast version (in Part 2 of this article) to hook the video up to the inputs on the MGCD, while using the VGA output from directly from the dreamcast to my monitor. Shorting out those two pins will only disable the video counter overlay, it will not fix this problem you are having. You will need to split off the video wires going into the MGCD to hook up to your monitor. I suggest you follow what I did on my Dreamcast version, and solder a second connection to the underside of the MGCD video connector and run that to your LCD monitor. Good luck! Sounds like a fun project for a driving cab. i have finally made some progress with my mgcd in a driving cabinet with xbox. Hey Pat, this is a difficult problem to solve as older LCD screens are very fickle about what input resolutions it will display. You need to find out what the "native resolution" of the LCD monitor is, and set your converter board to only that resolution (and make sure its at 60hz). Most older monitors have 1024x768 as their standard pixel-for-pixel native resolution, so start there. Lastly, I've herd of many people having problems with cheap upscaler boards not working on their LCD monitors...its a very common problem unfortunately. My only suggestion would be to install a CRT monitor in the cab. Sorry, wish I had better news. Good luck with the project! Yes, that does sound like a good idea! You should confirm that the scale is compatible with your monitor by hooking xbox -> scaler -> monitor just to test (without the MGCD). If that works fine for all your games, then do as you said and splice from the MGCD input (as MGCD still requires sync to function properly). Yes, it looks like R, G, B, CompSync, GND, AudioL, AudioR. hi there. im giving this a shot maybe u can shed some light on my problem. i got a house of dead 3 arcade cabinet, running a xbox with a mgcd. when i got the arcade it was working fine, as in u throw in the credit and once u die the game is over...i believe they call this "credit/round mode". then all of sudden the xbox hard drive just died :( i had no idea how to fix it, so onto the internet i went. figured out how to make a new hard drive for it with a cable i made and dumping the firmware etc. in the end i got house of the dead 3 on the xbox again to run. but for some reason no matter what i do i cant for the life of me get it to work in the same way, only timed mode works? i even emailed the guys who make it asking for some help, but u know how helpfull they can be. this guy gave me some type of cd that has a loader for the game and well i put it on the hard drive, but alas still the same problem, cant get it to go into "credit/round" mode.this loader is basically just so that when u turn on the xbox , the mgcd sends a command pressing i think its "a" twice to load the game. i figured this loader might have helped but nada... ill note that when i originaly got the game there was no loader loading when i started it, it went straight to the game... but i have done that method also. the guy said the unit might be broken, but only the xbox drive died so i dont believe thats the case. the unit i have is made by twe. the lable on the one rom says hod-01. no matter if i switch the unit to be 00 or 01 , that number just stays on the screen the whole time and should go away i believe when it picks up the game (the number is for xbox version as in one thats made before 2003 and one after). i believe its not picking up the game from the looks of it, throwing in credits does nothing. if i switch to time mode, i can play , but obviously i dont want it like that. i tried usa and eur versions of the game, but still does the same. u perhaps have any ideas? Sounds like this was a particular setup. When the drive failed, you said you were able to dump the entire contents of the disk and rebuild on a new drive? It sounds to me like it was a modified version of HOD and not retail, to work specifically with the MGCD. But I could be wrong as the MGCD is supposed to work with all the retail games...you just need to put in the correct dip switch settings. I'd suggest downloading the xbox MGCD manual, and confirm the dip settings is correct for retail HOD disk. hi, with mgccd i can boot all the games i want and not only jap games if i set it to all 1 on 8dipswitch? and you have the pinout of the video cable so i can hack it to a ps2? Not sure what you mean by "boot all games". This doesn't help booting different region games on a Dreamcast. There a bios hacks you can do to change your dreamcast region (google search should find them). You can't hack a Dreamcast MGCD to run on a PS2. You might be able to get the video to work, but the controls won't work. That said, if you wanted to hack the video, its pretty straight forward red/green/blue/ground/horizontal sync/vertical sync. Hi Aaron, I don't see your comment anymore, so I assume you already figured out. The Dreamcast requires its own power cord, so is independent of the cabinet jamma power, which is only used to power the PCB (not the console). But what problem you may run into is the fact that PAL version outputs 50hz, which may mean you have to adjust your monitor sync, but I think most arcade RGB monitors can still handle 50hz. According to that thread, to switch between PAL and NTSC, there are two chips, the ROM and a PAL security chip (which top scratched off). If true, this would be nearly impossible to region swap. But later on in the thread (second from last) someone posted what I said, which is if you have tbe MGCD-B model, it should work with both NTSC and PAL, just make sure you set the dip setting correctly per the manual I linked you to. Have you tried setting the dips to free play 256 minutes? Do you get video and sound but no controls? Did you remove pins 27+28 from ground in your jamma harness? As a last resort, if you want, you can region mod your PAL dreamcast to NTSC (http://www.mmmonkey.co.uk/dreamcast-region-change/). If this doesn't work for you then something else changed in your MGCD or cabinet wiring that is making the MGCD not boot correctly. I have another version for ps1 with only 8 dip, i want to atleast disable the osd, if possible put in free play too... Can you tell the model of the chip that drives the osd so i can try to disable it? Sorry I missed your post earlier. The chip has its top scratched off, so I don't know the model #, but I'd imagine its in a similar location on the PCB to the PS1 version PCB. The just try jumpering pins 1 & 2 and see if that removes the OSD.